The Coop Home Goods shredded hypoallergenic memory foam pillow enables you to modify the pillow to meet your personal needs. You can change the firmness, the thickness and even its construction to create the perfect, most comfortable pillow that you could dream of – or on! This pillow is enveloped with a removable cover that can be machine washed. It is made from a viscose rayon derived from bamboo, mixed with polyester. 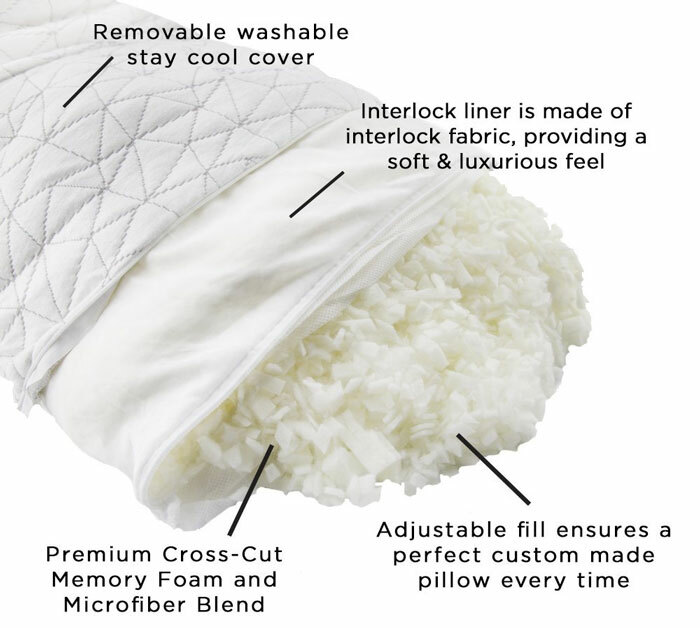 This combination offers a durable and highly breathable cover for your pillow. So why should the Coop Home Goods memory foam pillow be the perfect pillow for you? To answer that question, let’s first look at how people choose their beds. How not to choose a bed is to look at the aesthetics first and the comfort second. To be honest, the design of your bed has little to so with its comfort. Quite frankly, it doesn’t matter much if you have a bunk bed, a metal-framed bed with a spring base (as was common many years ago), or a modern box spring or slatted bed. Comfort comes from the mattress! True? Yes, but only partially so! It also comes from the pillow. Your mattress should offer good support for your body’s pressure points, particularly for your shoulders and hips. However, what about your head and your neck? Focusing on the shoulders and hips ignores a very important aspect of your body when sleeping. Your neck also needs support, yet many tend to ignore this when focusing on the lower parts of the body. Back pain is given a good deal of publicity, but what about neck pain that can be very debilitating. So let’s consider the neck here, where many people suffer pain. If you suffer from neck pain, then the best sleeping for you is either on your back or your side. For your back, think of the shape of your head, neck and shoulders. You need a pillow that is flatter (but comfortable) where your head rests and slightly rounded at the neck so that the natural curve of your neck is supported. Feather Pillow: You might find that a new feather pillow can support your head and neck initially, but it will soon flatten out due to the pressure of your head. Memory Foam Pillow: A regular memory foam pillow is a good solution because it conforms to the shape of your head and neck. However, there is no way to adjust the levels of support to meet your personal needs. Coop Home Goods Shredded Memory Foam Pillow: This hypoallergenic pillow not only protects you from allergies caused by your pillow, but it also supports your head neck as those above do. The difference is that you are able to pack or deplete the shredded foam in the pillow to fit perfectly to your head and neck positions, and offer equal support to each of these parts of your anatomy. Which of those above would you prefer? Each type of pillow has its benefits, although the Coop Home Goods shredded memory foam pillow appears to us to be the best option. Not only can you adjust it to the initial level of head and neck support you need, but you can also readjust or renew the shredded memory foam filling as it ages in order to maintain that perfect support for your head and neck. Here’s what the Harvard Medical School says about neck pain. Even if you have no neck pain or spinal issues that can arise from it neck pain, the COOP Home Goods shredded memory foam pillow enables you to sleep as comfortable as you can. This is not a pillow that you have to replace when it gets older and loses its support. Simply pack it again with the shredded memory foam and it’s as good as new. What about the pillow you are sleeping on now? To begin with, if this pillow provided you with the perfect level of comfort you would expect then why are you reading this? It could be simple curiosity, but it’s more likely to be because you are looking for something better! You know that your pillow is an extremely important aspect of a relaxing and refreshing sleep. In fact, if you are suffering neck pain when you awake in the morning, then you may need a new pillow. Mattresses are often regarded as the item of bedding that are most important with regard to sleeping well and preventing back and neck pain. Back pain sure, but your neck pain could be relieved by choosing the right pillow. Think about it: does your neck even have any significant contact with your mattress? It’s the pillow that counts. MyPillow Review: Is it Right for you? So Why Memory Foam Pillow? Why a memory foam pillow? For exactly the same reason that you may prefer a memory foam mattress to a latex mattress. Memory foam provides support where you need it and allows both your head and neck to be supported while you sleep. The memory foam in your Coop Home Goods pillow supports your head while conforming to the shape of your neck and head together. Your neck and head are equally supported, so your neck is not forced into an unnatural position while you sleep. Think about it! Your head is elevated on the surface of the pillow, and your neck bends downwards. With the Coop Home Goods memory foam pillow, your head is supported by the memory foam that allows your head to sink into it, while also supporting your neck in its natural position. That’s what memory foam does, whether used in a mattress or in a pillow. It conforms to the various angles of your body. It provides support to your pressure points (your head) and to those parts of your body that close to these pressure points (your neck). That is why we recommend a memory foam pillow. So let’s look closely at the Coop Home Goods memory foam pillow and consider why it is such a good buy for many people. A comfortable pillow is important to everybody – except those masochists that prefer a brick hard sleeping surface! Most of us know one or two of these – and they usually end up at their doctor with excruciating neck and back pains. The Coop Home Goods is extremely highly rated online, and you can adjust it meet your specific needs. So the pillow you order may not be the same as the one your partner orders, because you both may have different needs. Shredded Viscoelastic Memory Foam: The term ‘viscoelastic memory foam’ is a bit like ‘bouncy springs’ –memory foam is viscoelastic by definition just as springs are bouncy. However, shred that memory foam and get an extremely comfortable foam to sleep on that also allows excellent airflow through and around the shredded construction. It adjusts to the shape of your head and neck faster than regular memory foam and offers a cooler sleep. Polyester-Bamboo Cover: This type of pillow cover not only feels amazingly slinky-smooth against your skin, but it also adds to the breathability of the pillow. Personal Adjustment of Filling: You can adjust the filling to suit your personal needs! Beneath the removable outer cover of the pillow is a zippered inner case. You can open this to remove some of the shredded foam to make the pillow softer or add extra to make it firmer. 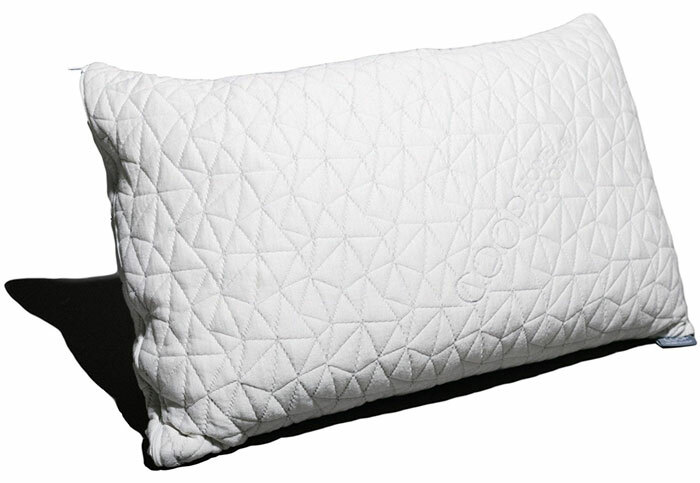 The Coop Home Goods shredded hypoallergenic memory foam pillow is ideal for anyone who is getting pain in their neck when sleeping, or who has never used their pillow for whole-body comfort. Simply follow our advice and enjoy a pain-free sleep on an amazing hypoallergenic pillow. One that supports your head while also supporting your neck while you sleep. This particular pillow is created with shredded Visco elastic memory foam. This allows for greater airflow and adjusts way better than a normal memory foam does. The polyester-bamboo cover adds to the breathability and feels amazing against the skin. With the Coop Home Goods memory foam pillow, you get a shredded hypoallergenic memory foam option, and also one that keeps your face steady while sleeping.